The Longines FEI World Cup™ Jumping Thermal kicked off at HITS Desert Horse Park with Thursday’s $36,500 Desert Welcome Stake CSI3*-W class. As the final stop on the West Coast to qualify for the FEI World Cup™ Finals in Omaha, Nebraska in April, each rider is hunting for points this week. It all leads up to the main event, the Longines FEI World Cup™ Jumping Qualifier on Saturday, February 11 at 3pm PST. This class belonged to young Canadian equestrian, Ali Ramsay of Victoria, British Columbia. Ramsay soared her way to the win aboard her partner Hermelien VD Hooghoeve, a striking and powerful bay mare. Going second in the order of a four-horse jump-off, Ramsay and her mount laid down a cool, clear round to take home the winning title. Lane Clarke of Laguna Nigel, California, challenged the abbreviated course first riding Balu U, owned by Georgy Maskrey-Segesman. They came in on the right lead and flew straight to the first fence, an oxer mid-ring. They clocked in clear in 44.05 to set the tone for the remaining three challengers. Ramsay came in next, opting to begin the course on the left lead instead of the right, which Clarke did. The course was technical and winding, putting riders and horses’ skill to the test. 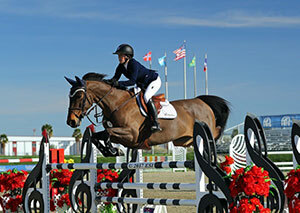 Following Ramsay in the jump-off was Harley Brown of Portola Valley, California, piloting Apex, owned by Emma Catherine Reichow. They started off on a quick pace and conquered each fence until the fourth fence on course, the A element of the combination, tripped them up. They finished the course with four faults in 44.50 for the eventual fourth-place finish. The final rider to contest the abbreviated course was Austrian equestrian Peter Petschenig riding Colour Your Life. An unfortunate rail at the first fence sealed the victory for Ramsay, but there was still time to shave off of Brown’s time, and the third-place prize was still within Petschenig’s grasp. Petschenig and his mount flew through the course, kicking their pace up a notch on the long gallop from the mid-course combination to the third-to-last fence on course. They galloped home and crossed the timers in 44.35, a few tenths of a second ahead of Brown to secure third-place. Daniel Pedraza of Mexico narrowly missed the jump-off due to one time fault. He would take home fifth place riding Arc De Triomphe. The Longines FEI World Cup™ Jumping – Thermal CSI3*-W continues tomorrow with the $36,500 Desert Classic. Don’t miss the class LIVE at 2pm PST on HITS TV, the FEI YouTube Channel and FEI TV.